The Miami Trace gymnastics team prior to District meet processional; (front, l-r); Jaina Applegate (Washington High School), Lizzy Valentine (Greeneview High School) and Jenna Hinkley (Washington High School); (back, l-r); Devan Thomas, Debbie Abare, Maddie Southward, Grace Rolfe, Tori Waits, Gracie Greene and Abby Arledge. 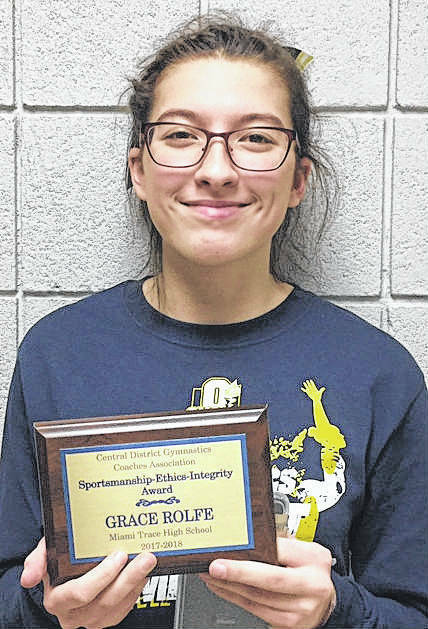 Grace Rolfe was the recipient of the District Sportsmanship, Ethics, and Integrity Award. Tori Waits performing on balance beam. She scored an 8.45, good enough to place 26th out of a field of 141 gymnasts competing on the event. Devan Thomas completes a tumbling pass with a back tuck as her teammates and coaches cheer her on. Maddie Southward executes a beautiful layout salto within her floor exercise routine. 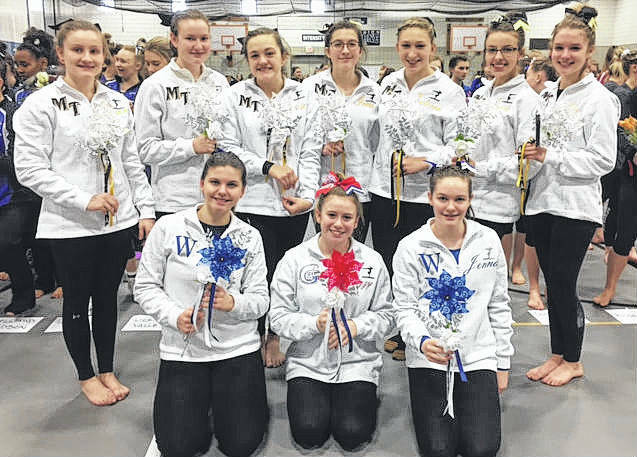 The Central District tournament for the State high school gymnastic program was held at Worthington Kilbourne High School this past weekend. Twenty-six schools fielded teams in the tournament. The number one seed, Olentangy, came in second scoring a 139.5 behind Sheridan’s 145.425 winning team score. Both teams will represent the Central District at State competition this upcoming weekend. Miami Trace completed their season combining for a 121.325 finish – recording a 16th place in the panel of 26 schools. 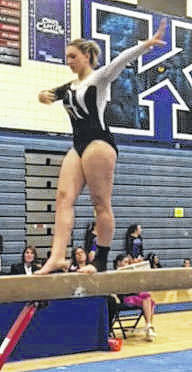 Panther sophomore Devan Thomas, participated on all four events coming in 37th of 93 gymnasts vying in the all-around competition. Thomas was 47th out of 134 on vault (8.0), 74th out of 136 on bars (7.1), 36th out of 141 on balance beam and 60th out of 138 on floor exercise. Teammate Victoria Waits earned an 8.45 score from the judges for her routine on balance beam. This placed her 26th on the event. Waits also scored an 8.0 on vault. Freshman Debbie Abare led her team on the uneven bars with a 7.5 score. Grace Rolfe received the District sportsmanship award. “I am proud of this team this season,” Miami Trace coach Susan Holloway said. “We have had many accomplishments throughout the year. Beating the 15-year school record was sweet. “We have a young team that continues to improve,” Holloway said. “The girls are adding difficulty to their routines. They are increasing their skill level. Today, not one gymnast fell off of the balance beam. We had two girls who truly had a chance to make it to State. “I look forward to the off-season to keep getting better, stronger and more confidant,” Holloway said.